U.S. intelligence analysts watching for indicators of Israeli military action recently reported that there are signs the Jewish state plans an attack against Iran in October. The Obama administration, meanwhile, is preparing to provide logistical support for a military strike but is pressing Israel to delay any action until the administration’s policy of sanctions have had more time to work, and that any attack would be put off until after the November presidential election. 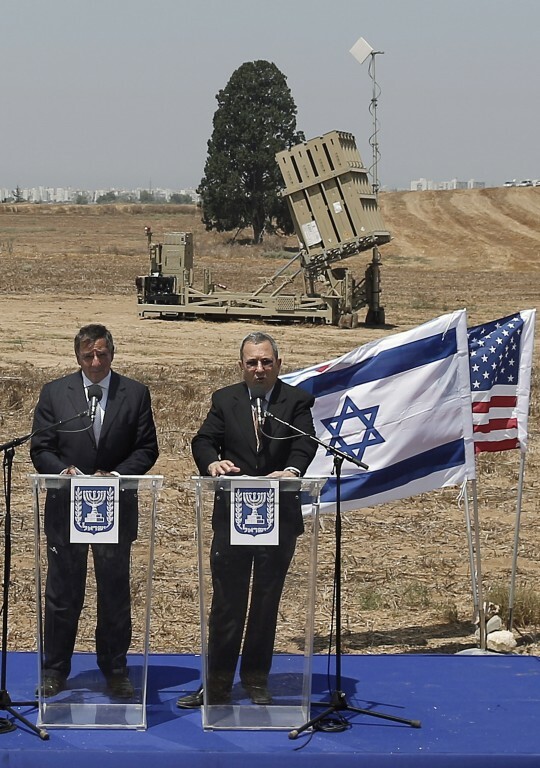 U.S. opposition to any pre-election strike was discussed during the recent visit to Israel by White House National Security Adviser Thomas Donilon and a later visit by Defense Secretary Leon Panetta, according to U.S. officials. Panetta signaled possible U.S. military options for an Iran contingency during his press conference in Tel Aviv with Israeli Defense Minister Ehud Barak Aug. 1. Panetta said the United States and Israel are united in seeking to prevent Iran from ever having nuclear arms. "We have been steadily applying more and more pressure against Tehran, focusing on diplomatic and economic sanctions, and I believe these steps are having an effect," Panetta said. He then added: "It's my responsibility as secretary of defense to provide the president with a full range of options, including military options, should diplomacy fail. President Obama has made clear that preventing a nuclear-armed Iran is a top national security priority by the United States and that all options — all options — are on the table." Any Israeli military attack is expected to be carried out with little or no warning, which has meant stepped up monitoring of Israel by U.S. intelligence agencies for all indicators of an impending attack. Ehud Barak, the Israeli defense minister, made a significant statement on Israel’s plans on July 25. Barak said during a graduation ceremony that if sanctions fail to halt Tehran’s nuclear program, an attack would be needed. "I am well aware of the difficulties involved in thwarting Iran's attempts to acquire a nuclear weapon," Barak was quoted as saying by Israel’s Ynet news agency. "However, it is clear to me that without a doubt, dealing with the threat itself will be far more complicated, far more dangerous and far more costly in resources and human life," he said, referring to a future nuclear-armed Iran. Barak also said that sanctions and other diplomatic steps "are not enough to stop Iran's nuclear program." U.S. officials said both Donilon and Panetta urged the Israelis to give sanctions a chance to work. New sanctions were imposed on Iranian financial institutions last week. But the sanctions contain loopholes that critics say will limit their effect in influencing Iran’s Islamist regime from coming into compliance with international controls on its nuclear program. The International Atomic Energy Agency, contradicting standard U.S. intelligence analysis, stated recently that there are signs Iran engaged in nuclear arms development past 2003, when U.S. agencies said such work halted. Some Israeli military leaders are said to be raising new concerns that Iran is positioning its forces for asymmetric counterattacks, specifically a new aggressive naval strategy of shutting down western oil supplies. Evidence of the new strategy was the recent dispatch of Iranian warships to the Mediterranean for the first time since 1979. The warships could be used to threaten shipping through the Red Sea and followed threats by Iranian officials to close the strategic Strait of Hormuz, through which a major portion of the world’s oil passes. Other Israeli military and national security officials favor continuing the current campaign of covert action against Iran, including the assassination of key Iranian nuclear technicians and the use of aggressive cyber warfare attacks, like Stuxnet, Flame, and other viruses that have infected Iranian industrial control networks, including those engaged in nuclear development. Intelligence analysts, in recent assessments, said an Israeli attack on Iran likely will trigger a global oil crisis involving Iranian counter-actions designed to disrupt the flow of oil from the Persian Gulf to Asia, Europe and elsewhere. They include closing the strategic Strait of Hormuz and disrupting shipping lanes. One element of leverage for the administration in dissuading Israel to attack was outlined in the recent meetings with Israeli officials who were told that a U.S.-supported strike against Iran possibly could involve advanced weaponry from the U.S. arsenal, including a new Air Force conventional bomb designed to blast deeply buried and hardened targets. The Israeli strike plan against Iranian nuclear facilities is expected to include an air bombing campaign against two main nuclear plants at Natanz and Qom that are key elements in producing enriched uranium, which could be used to fuel nuclear bombs. Military analysts also have said the Israelis are expected to launch "decapitation" bombing raids targeting key Iranian leaders — including President Mahmoud Ahmadinejad who publicly has called for destroying Israel — and other key Iranian military and political leaders. One veteran Israeli journalist, Channel 2’s Ehud Yaari was quoted July 28 as saying he was told the most likely date for an Israeli military strike is October. "I will give you an impression, and this is just an impression, but it is a strong impression, after conversations with the people one needs to talk with about this matter," Yaari said. "My impression is that the Americans are convinced that there is very high chance that Israel will decide to attack in Iran before the elections in the U.S."
"The date that they are talking about — they say that the prime minister will have to make a decision around October," he said. "They are getting ready for a possibility like that in the sense that they have to decide what they will do if there is one response or another by Iran, in the follow-up stage." "But when you talk to them, they talk about [an Israeli strike] almost as a given—as a clear, unassailable fact." The sensationalist Israeli newsletter DEBKAfile reported July 29 that its sources in Washington report "October is often mentioned these days in the White House, the Pentagon and top military command as the month to watch." The report said Persian Gulf states would prefer a U.S. attack rather than an Israeli strike. The July 29 report said senior Saudi officials recently told western officials that they have been assured by the United States that the Israelis will be the first to attack and that U.S. forces would later join in. The Saudis also were told that the Obama administration has been pressing the Israelis to hold off from conducting an attack but that Washington cannot be certain that Israel will wait. The Untied States currently has two aircraft carrier strike groups in the region. Iran’s nuclear facilities, in addition to the enrichment facilities at Natanz and Qom, include research reactors at Tehran, Bonab, and Ramsar and nuclear sites at Bushehr, Arak and Isfahan. All are potential targets. This entry was posted in National Security and tagged International Atomic Energy Agency, Iran, Israel, Leon Panetta, Mahmoud Ahmadinejad, Middle East. Bookmark the permalink.